One of the most important features of your web hosting service is your control panel – the tool that enables you to administer your website. Whilst there are many control panels available, including a range of own-brand panels developed by web hosts, the two most popular ones are Plesk and cPanel. They are, essentially, the Android and Apple of the control panel market. In this post, we’ll compare both applications so that if you are given a choice over which one to choose, you can make a more informed decision. Originally introduced back in 1996, cPanel is a much-loved platform used on millions of websites and is frequently included in many Linux shared hosting packages as well as being used for dedicated servers and cloud hosting. For those who have access to their server, cPanel often comes with WHM (Web Host Manager) a sister program that acts as a server administration interface. Plesk was launched in 2001 and, like cPanel, has come to be a dominant force in the control panel market. The most recent version, Plesk Onyx, which has over 100 extensions, is available in three versions, Web Admin, Web Pro and a special version for web hosts. cPanel was developed to work on Linux servers and is currently incompatible with Windows. It is, however, compatible with CentOS, CloudLinux and RedHat Linux distribution based operating systems. Originally developed for Windows, for which it is the world leader, Plesk can also be used on a wider range of Linux OS, including Debian, Ubuntu, CentOS, Red Hat Linux and CloudLinux. In many cases, the control panel you use may be dictated by the operating system you (or your host, in the case of shared hosting) run on the server. Whilst both offer very easy to navigate control panels, the Plesk interface is more in line with the standard software layout that most people are accustomed to. Very similar to the WordPress admin panel, it has its main menu down the left-hand side and when an item is selected, its contents appear in the main panel. A further set of feature boxes are located on the right side of the screen. For ease of use, icons are used for each of the main features. The cPanel interface is laid out differently. The left-hand menu is missing and, instead, the features are grouped into sections which you access by scrolling down. Like Plesk, each feature has an icon to help you identify it. The cPanel interface also has some customisation options to make things easier to find. 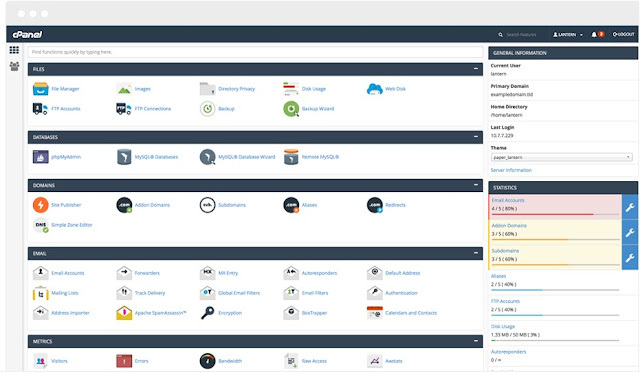 With regards to how the panels are organised, cPanel groups its functions under the headings of preferences, mail, files, logs, security, domains, databases and software services whereas Plesk divided its functions into areas such as statistical and resource usage, users, mail, websites and domains, applications and statistics. Surprisingly, the WHM control panel, which is separate to cPanel, has the standard interface with the left-hand menu. In this sense, it is more like Plesk, than cPanel. Plesk and cPanel both enable users to have command line access. cPanel provides command line and API-based access, the latter enabling interaction with third-party apps. Command line access from Plesk comes via its not so succinctly named ‘Panel Action Log Command Line Access Tool’. cPanel developers have worked hard on raising its performance over the years, and it’s is generally accepted that it is the fastest loading out of the control two panels. This has been achieved by reducing the amount of RAM that cPanel needs, meaning that it performs quicker page loading, account creation and other operations. Out of the box, Plesk comes with build in support for a wider range of apps and extensions, however, cPanel also enables lots of apps to be added, too. Web security is essential today and both cPanel and Plesk provide a wide range of security tools to protect users. cPanel, for example, includes tools such as IP address denials, auto installation of SSL certificates and password-protected directories whilst Plesk’s security suite includes tools like active directory integration, in and outbound spam filtering for email and fail2ban intrusion prevention. Both cPanel and Plesk have developed smartphone apps that enable you to connect with and manage your server and website while you are on the go. There are also a variety of third-party apps you can use.